Site with 1 vehicle $25/ Extra vehicle $5 Hookups water and electric $12. ( no discounts on hookups) Showers will be available this year for $2.50. LOCATION: Route 16, 5 miles south of Gorham. 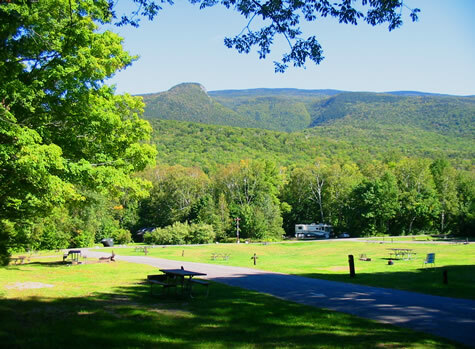 Dolly Copp is one of the largest campground in the entire National Forest System. One any night over 1000 people my be camping at Dolly Copp! Each campsite has a picnic table and a fire ring with a grate. Toilets, drinking water and trash recycling containers are a short walk from the sites. In order to maintain a rustic atmosphere, Dolly Copp does not have any hookups, dump stations, or showers. The Appalachian Mountain Club’s (AMC) Pinkham Notch Visitor Center (approximately 5 miles south of Dolly Copp) offers coin operated showers. During the peak season, several sites can be reserved through the US National Forest Reservation Center. 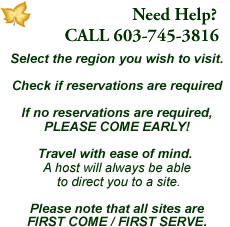 The rest of the sites are available on a first-come, first serve basis. While you are visiting Dolly Copp you may encounter the American Black Bear, Ursus Americanus. DO NOT FEED BEARS! Bears eating human food lead to human-bear conflicts which may result in the death of the bear and injury to humans. Wild bears are shy and prefer to stay away from people but FOOD ODORS ATTRACT BEARS. Keep all food stored in vehicles, never in your tent. Dispose of garbage promptly in nearby campground dumpster’s. Never dump, burn or scatter food near your campsite or in the woods. Never leave food outdoors for wildlife or pets.